If you aren’t intimately familiar with the Honey Badger, check it out here. 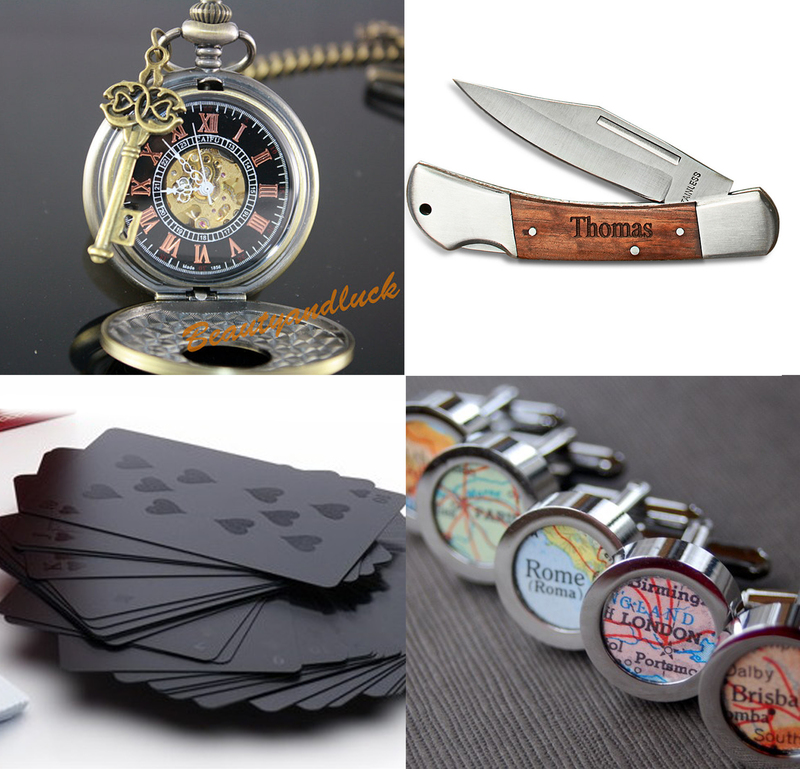 For the Luxury guy, a really nice pocket watch is a great gift; for the outdoorsy guy a classy, yet functional hunting knife is really great; for the gambling man I LOVE these opaque cards; and of course for the man who likes to travel, these great map-style cufflinks. But I did leave one man-type out…on purpose…because he deserves his own collage of gifts: the geeky guy. Even though I don’t often show it, we are a through and through geeky couple, so these gifts are near and dear to me. You can give a classy gift that still has a really geeky side. 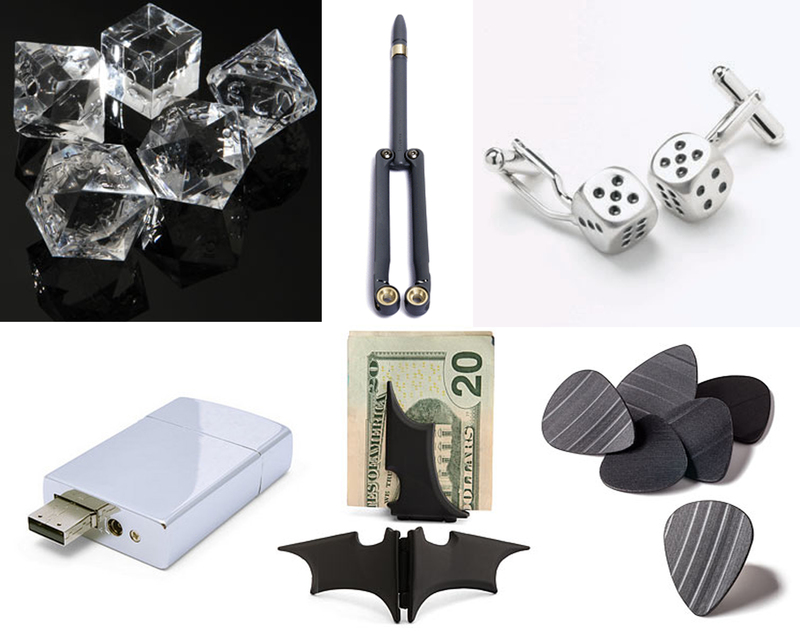 Every serious gaming nerd needs a set of these stylish dice; the pen opens up just like a butterfly knife; dice cufflinks for the day are super fun; any computer geek loves to carry around a USB drive wherever he goes; comic fans will go nuts for the Batman money clip; and any music nerd will love these guitar picks recycled from old records (remember them?). And of course, just like the girls, why not pack a whole kit for your groomsmen, completely personalized for them! However you and your man choose to give gifts, remember that you are thanking them for making your day special, so it’s so important to make their gifts special and unique to them. What kind of man does your hubby-to-be hang out with? Are they a flask man? Or maybe more of a Batman dude? Aw! You’re so sweet! Thanks for reading! Ok – now I need to get my husband that Honey Badger flask for his birthday. He will LOVE that!! I tried to convince him to get those mustache flasks for his groomsmen, but he figured a bottle of Gentlemen’s Jack was better. Haha I love the Honey Badger flask! The site where I found that had a whole bunch of funny flasks! I think the boy is going with personalized gifts for each of his groomsmen. But he hasn’t seen the Honey Badger flask yet!